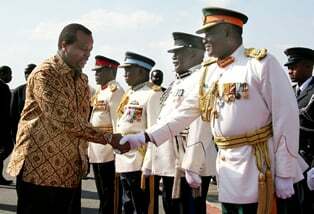 King Mswati of Swaziland is on Friday expected in the country to join Zambians in celebrating the country’s 51 years of Independence. The Swazi King who is the guest of honour for the celebrations will be welcomed by President Edgar Lungu at Kenneth Kaunda International Airport. President Lungu and King Mswati are expected to lead the country in celebrating the end of the country’s Jubilee celebrations. President Lungu and his counterpart are also expected to hold bilateral talks at State House. And on Saturday the President and King Mswati will lead hundreds of people at the Independence Day anniversary celebrations at the National Heroes Stadium where a variety of entertainment will be on display. President Lungu’s Independence activities started on Saturday October 17th when he launched a new tourism product dubbed Pamodzi Carnival at the Lusaka Show Grounds. And on October 18th President Lungu was part of thousands of people at the National Day of Repentance, fasting and prayer at the Lusaka Show Grounds. Meanwhile Special Assistant to the President for Press and Public Relations Amos Chanda announced that on October 25th, the President is expected to officiate at the ground breaking event for the New Tabernacle National House of Prayer. The House of Prayer will be an interdenominational Church building that will be situated in the Woodlands forest area. Zambia on Saturday celebrates her 51 years of Independence under the theme “Laying a Foundation For a Smart Zambia, finding forgiveness repentance, compassion and Love in God”. I don’t like him because of the way he abuses women. Hide your daughters! Here comes Pervy Mswati! Mswati Mswati Mswati and how many wives has he got? what is the age of the youngest and the eldest? how many children has he got. please journalists ask him these questions. in his country anyone who questions him disappears so we can do a favour for our brethren in his kingdom. oh before i forget, does he consider women property or human beings? I really wish ka Lungu had the 2-ngwee sense to keep this polygamous and misogynistic Swazi bástard as far away from Zambia as the Geneva Conventions permit. Do not come with those women in Zambia. Ama Zambians bakali bakakunyengela utokash tobe. This man should be a very good friend of RB and ECL. Of all presidents Mswati! Is it just a case of inviting presidents. Honestly, I think it is even better not to have one. Why not president of Botswana where we can learn something. King Mswat’s attitude towards women is appalling truly! He dies this in the name of tradition!